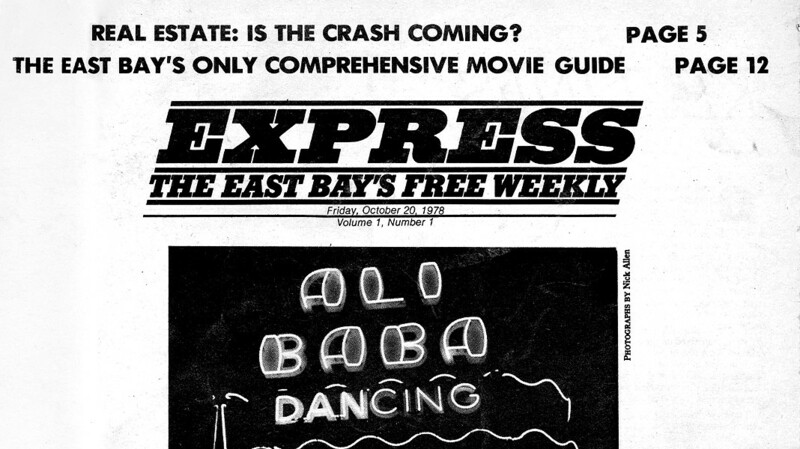 For our 40th anniversary, we compiled a list of 40 of the Express' memorable in-depth reports and the topics we've loved writing about the most. "Obviously, the East Bay has changed a lot over the past four decades and so have the tools and techniques this paper uses to describe it." When I sat down in mid-September to review some of our most memorable stories of the past 40 years, my first thought was, "We should've started this project months ago." Going through all the old bound copies of the Express (our online archives only go back to 2001) seemed daunting. But then as I started to leaf through all the old issues, a few things struck me: It's super fun to peruse the Express' past (I'm a history buff and have been reading the Express since 1979) and I'd never realized that we had kept returning to the same topics over and over again during the past 40 years — and that we're still writing about them. Along the way, I also had another epiphany: Express cover stories and investigations, especially in the 1980s and '90s, helped shape my politics and world view. Care to guess which topic we've explored in-depth and have featured on the cover the most? Our longtime readers should have no problem with this one: police and law enforcement misconduct and cops killing young unarmed Black men. We've been investigating this issue and putting it on the cover since 1979. Other topics we've returned to repeatedly over the years should also come as no surprise to longtime readers: homelessness; gender and LGBTQ issues; gentrification and housing; pollution and the environment; and the decades-long battle to save the Sacramento-San Joaquin River Delta. We've also written time and again about the next looming big disaster in the East Bay — whether it will be devastating earthquake or wildfire in the hills. And, of course, we've closely chronicled the East Bay's arts and culture, food, and music scenes. This top 40 list also includes many of our best standalone stories over the years — stories that affected change or simply shed light on an important or fascinating topic. By no means is the list comprehensive. But we hope you'll find it interesting. We also asked some of our current and former staffers to reminisce about their most memorable stories. The list is mostly in chronological order and begins with our co-founder and longtime editor John Raeside's memory of our first cover story. "Sometime during the workweek that concluded on Friday, Oct. 20, 1978, a young photographer named Nick Allen mounted the steps at 3254 Adeline St. in South Berkeley. He passed by a collection of newly constructed wooden distribution racks, arrayed atop the stained linoleum of an otherwise barren lobby, and advanced into the drafty warren of unheated rooms that comprised the offices of the fledgling East Bay Express. Later that week, the racks would be distributed to street corners around Berkeley and Oakland, where they would receive the paper's inaugural issue. The very first cover story Allen had been assigned to photograph was written by a retired dockworker and Beat poet named George Benet, and celebrated the Ali Baba Ballroom, a prominent downtown landmark from prewar Oakland. The print the photographer handed in that day was a stark image of an aging couple lit by the garish, sepulchral wash of a Weegee-style Speed Graphic flash: he in a three-piece gabardine suit, the tennis-ball-sized knot of his tie riding jauntily beneath his prominent Adam's apple, a crisp fedora held in his hands; she in a modest cloth coat buttoned to the throat and belted at the waist. Above their heads floated the fat neon letters that graced the marquee: Ali Baba. Dancing. Even though Allen brought another picture with him that morning of a similarly posed but much younger group of Ali Baba patrons — ballroom dancing was experiencing a boomlet among the twenty- and thirtysomethings of that era — there was no question about the image we would choose for our first cover. It was exotic; it was authentic; it was nostalgic; it was gloriously black and white; it was ... Oakland. By the autumn of 1978, while echoes from the rapturous tumult of the 1960s were still resonating through American mass culture, here in the East Bay, where so many of the seminal events of the 1960s had actually taken place, the fires had burned to embers. Vietnam-era student activists had joined veterans of the Free Speech Movement and settled down in flatland Berkeley and North Oakland neighborhoods, displacing the annual autumnal stream of Cal students and sparking both a housing crisis and, only months before, Berkeley's first rent-control ordinance. At People's Park, an uneasy truce was holding, and memories of the military occupation of the city were growing more distant. The rail line where protesters had gathered to stop troop trains at the height of the Vietnam War still existed, but only one sleepy freight train was left to clatter through the backyards along Sacramento Street each day. The massive demonstrations that had shut down the university were more than eight years in the past. Now, fraternity row was undergoing a renaissance, Animal House was playing to packed houses at the Act One, and toga parties were the season's rage. There were only two businesses of consequence on Berkeley's Fourth Street, Brennan's and Spenger's Fish Grotto, the latter nestled comfortably among the nation's top five highest-grossing restaurants. Meanwhile, from our perch in Berkeley, the small staff of the Express was looking curiously out at the less-familiar region that surrounded us, organizing expeditions into the unexplored wilds of the urban East Bay. As writer John Krich would put it in these pages a few months later: "Oakland offers a challenge, it represents a quest: to unearth the urban, to seek out the resources and reverberations to be found behind the ghost town facade."